A versatile setup has been developed named Hammaka Hammmock Hitch Stand through which people can erect a hammock virtually anywhere just by hitching it to the car. This is the simple and innovative design which allows quick or almost setup without any kind of effort. These chairs can also support a generous 114kg as well as it includes footrests, detachable headrests and cup holders for the purpose of added comfort and convenience as well. 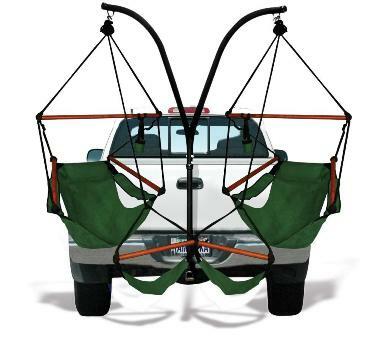 Now you can hang the Hammock or Hammock chairs to your vehicle easily. It is based off of current trailer of Hitch Stand of the designers. But they want to innovate the original trailer Hitch Stand and that’s why this setup has been developed which is stronger and easy to pack. An ability to hang a regular hammock has also been added by the designers. There were long time efforts of the designers and finally they have released it. There are two versions of the hitch stand. Most of the versions which are available online are old as well as holds 2 hammock chairs. It is known as Trailer Hitch Stand. But this new version Hammock Hitch Stand can hold two hammock chairs as well as it is also a conventional camping hammock. It is only available on its websites and on Amazon store.